Chemo round 9 was on August 29th. I did fairly well and was quick to bounce back to my “new normal”. The week before was a little rough. I found myself dehydrated and that really took a toll on my body. I was unsteady on my feet and my energy level was extremely low. When I went in for treatment on the 29th the nurses gave me an extra bag and a half of fluids. It was amazing how the extra fluids helped me return to this “new normal” I am learning to live with. I find myself frustrated with the reality that I am about half the man I used to be. My stamina is very low and I get tired so easy it is often disheartening. This Sunday we had a luncheon after church. At the end of the meal I was sitting in my chair thinking about getting up. I was not debating whether I wanted to get up…I was planning how I would move from my chair to an up right position. One of the women at the table has walked closely with someone with Cancer. She was watching what I was doing, just sitting and thinking. She commented, “He is debating how he will stand up…give him a moment.” She was 100% correct. 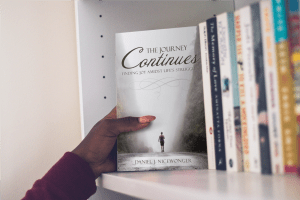 Her past journey allowed her to see what others at the table could not. I laughed and began the process of standing up. Saturday afternoon I looked out in my backyard and saw five or six logs that needed to be split for the fireplace. I boldly went outside, fought my way up to the shed, got the maul and went over to the logs. Two logs and six swings of the maul later I was done. I put the maul down and headed for my chair. The rest will be taken care of later. A few short months ago I spent an afternoon outside with my maul. We attacked a large maple tree and split close to forty large pieces of wood before taking a break. I am not half the man I used to be. On Monday Nancy, Rayann and I went to Gettysburg PA to spend some quality time together. I normally drive everywhere. This time I slept most of the way to Gettysburg. I did manage to wake up and offer a few constructive comments regarding Nancy’s driving…which she quickly chose to ignore. 🙂 Once we made it to the park Nancy asked if I wanted her to “drop me off at the museum?” “No, I can certainly walk from the parking lot,” was my reply…it was a mistake. I made it to the building but the energy I wasted on that walk was not wise. Once inside I found myself uneasy around the crowds. People who all seemed so sure and strong on their feet as they walked, rushed, and pushed their way to wherever they were going. I was nervous and was constantly watching to be sure nobody pushed me. It is kind of comical if you think about it. Here I am, 6′ 5″ tall 255 lbs and I am worried about someone much smaller bumping into me and knocking me over. The day was great. We enjoyed our time together. The park was beautiful…even though there was such a tremendous loss of life on those grounds so many years ago. I slept most of the way home. Who is this person I see in the mirror? Certainly not who I am used to. Nancy was driving me somewhere and we started talking about the new me. A number of years ago Joseph and I had this dream of hiking the Appalachian Trail from start to finish. There was something exciting about spending a few months together walking from Georgia to Maine. The 2,190 mile journey would certainly be an adventure. Life got in the way and our plans had to be set aside and we have never got back to attacking the dream. As Nancy and I were driving down the road I said, “Nanc, I will never get to hike the Appalachian Trail with Joseph.” There is not much to say when I come up with pronouncements like that. Nancy is very good at finding something to be hopeful and optimistic about. This time she said, “Well, you could hike parts of it…just not the whole thing.” She is right. I could spend some time walking on the trail but it will never be what it used to be. 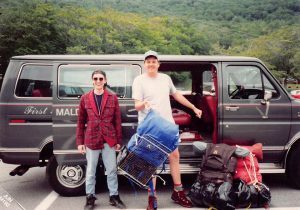 A few days after my Appalachian Trail comment a good friend of mine posted a picture on Facebook that took me back to a great time. Dave, Mark and I decided we would go hiking in the White Mountains of New Hampshire. We planned, prepared and started out on our adventure. A few wrong turns on the trail and what was supposed to be a fairly short and easy hike turned into something resembling a death march. We eventually made it to our destination and got camp set up just before dark. We spent a few days in the mountains and it will always be a special trip. Tuesday was another test. I had a scan of my liver and colon. They will compare it with previous ones to see how I am responding to treatments. I will not have the results from this scan for a few days but my latest CEA test results are in. My number has dropped to 2.6! At the start of this journey my CARCINOEMBRYONIC ANTIGEN (CEA) blood work results were at 124. In June the number had dropped to 37.4 and then in July it dropped even further to 3.9. “The CEA test measures the amount of this protein that may appear in the blood of some people who have certain kinds of cancers, especially cancer of the large intestine (colon and rectal cancer).” This is great news. My body is responding to the treatments in the best way possible. In mid October I will learn of our long range plans regarding chemotherapy treatments. While there are times of frustration I am always reminded of the many blessings. 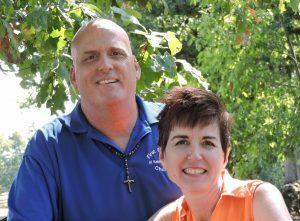 Although not as strong as I used to be I am still able to work and serve at First Baptist. The truth is that I went from working fifty to fifty five hour weeks to working thirty five to forty hour weeks. I am able to spend time with my family and friends. There are people coming alongside and walking this journey with me in amazing ways. We are seeing good things happen at church. God is working to redeem and transform a difficult situation into something healthy and life giving.